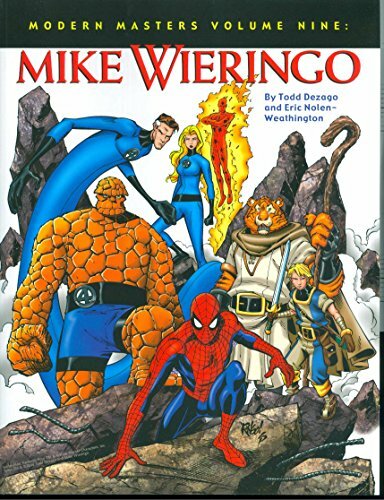 The latest volume of the Modern Masters series looks at the life and work of one of today's top comic-book artists, Mike Wieringo. Wieringo hit the comic book industry running, armed with a fresh, unique style all his own. Merging elements of manga with the power of the Marvel comics of his youth, he quickly became a fan-favorite. His work featuring Robin and Superman, Spider-Man and the X-Men — not to mention the creator-owned world of Tellos — has cemented him as one of the top artists in the business. And his recent run on Fantastic Four ranks among the best in the title's long and prestigious history. Now Todd Dezago and Eric Nolen-Weathington give you an inside look at the artist's life and career! This 120-page volume presents his most comprehensive, career-spanning interview to date, and is jam-packed with tons of rare and unpublished artwork, including an eight-page full color gallery. It's the ultimate look at the work of a true Modern Master: Mike Wieringo!